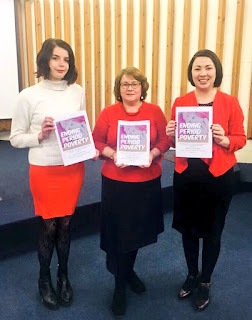 Today is the final day of the consultation on the Members' Bill put forward by Monica Lennon MSP on the issue of period poverty. I have responded to the consultation indicating my support for this proposal. Menstruation is a natural bodily function for women. Sanitary products are important for maintaining health. The fact that cost can determine whether some women are able to afford these essentials is wrong. I support this proposed legislation because of this, it is important that we find a way of providing access to sanitary products in such a way that involves no stigma. As the local councillor I was really pleased last week to see the University of Dundee and DUSA supported the proposal and are also providing free sanitary products before the Scottish Government implements a policy to provide free sanitary products in educational establishments. A number of retailers have been looking at ways of assisting with this issue and, for example, the Co-operative Group has undertaken to pay the VAT on sanitary products. Scotmid Co-operative and others have supported organisations such as Positive Steps to provide hygiene packs for the homeless. I hope that this proposal will be taken forward in the Scottish Parliament.